Title: A CHRONICLE OF THE KINGS OF ENGLAND From the time of the ROMANS Government, unto the Death of KING JAMES. Description: London, H. Sawbridge, B. Tooke and T. Sawbridge. 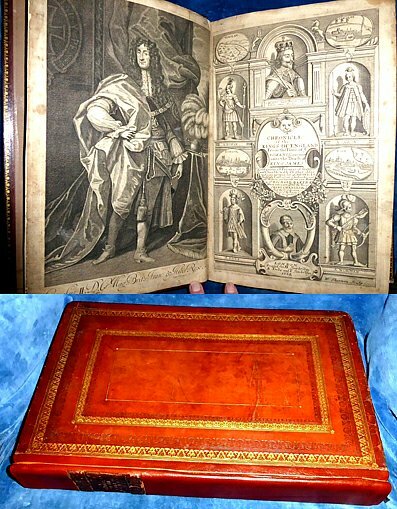 1684 Frontis of King Charles II + fine engraved Titlepage with views of London, York, Lincoln & etc. by W. Sherwin. . Folio gilt and blind-stamped double panelled calf, recent neat reback in matching leather with original gilt spine label from fine early-19th century binding set in. All Edges brightly Gilt. Frontis + engraved titlepage + printed titlepage +pp (Epistle to the Reader, Cataloque of Writers, list of Kings, Nobility) +p blank +750pp +pp index +pp blank. Collated complete A6+b2-k2+B4-Tt4+Aaa-Mmmmm4. Engraved Frontis and Title long ago underlaid onto matching paper, circular Library blind stamps to lower corner of 7 preliminary pages (other ownership marks of earlier provenance are noted below). Top corners of first few pages browned, outer margin at end of index has brown stain not touching print, pale foxing to some other pages, but paper strong, clean and supple throughout. *Successive owners are indicated by: 18th century signature "Thom. W. Bruce" at titlepage top; fine gilt decorated red leather label "Mrs. Buckmaster 1831" on pastedown; ink note on free endpaper "C.J.B. from his uncle R.N.B. 1892"; and Wigan Library label dated 1934 on back of Title, recording Mrs. E.J. Buckmater's gift in memory of her husband Rev. Charles John Buckmaster (1850-1925). These later notes lead back to 1831 bookplate owner's probable identity: Joanna Harriet (1792-1865), widow of John Buckmaster (d.1820) who came from a slave-owning family in Jamaica. The 1892 inscription is probably from their son, the Rev. Robert Buckmaster (born 1819) to his nephew C.J. Buckmaster, whose widow presented this book to Wigan Library in 1934.